So … I’m binge-watching GoT and losing the PLoT because this is eating into “work on my business” time. Yes, this article … the one you are reading on the web right now! Could a freelance writer create this article for me and free me up from doing the work? In theory, yes. Digital sorcerers say anything can be outsourced. In reality, however, content outsourcing is not as easy or as simple as many experts make out. You may end up battling to find a good writer and there’ll be many trials and combats you’ll need to overcome. Instead, I invite you to come with me on a journey … a quest, if you will, to explore the challenges businesses face outsourcing content and to try and separate fact from fantasy and myth from reality. Most businesses wants things “done for them” so they can focus on other things. This includes adding new content to their websites on a regular basis. According to most outsourcing experts, all you need to do is visit a freelance site and you will find many writers eager to bid for the opportunity to write your content. A sells-word will not only ghost write your content, they’ll also happily transfer all their rights to you and agree to remain forever faceless afterward. Thousands of ghost writers await to do your bidding. So … why not just hire a sells-word to do the work for you? So … here I am on another night’s watch and I’ve hit a huge wall. Things are going round and round in my head and I am feeling challenged because I want to outsource the writing of an article dealing with the challenges of outsourcing the writing of an article. Oops … sorry! Got my channels mixed up. Fact and fantasy are starting to blur already! Now … where’s that remote? Ok, then … before I can give someone else the work of writing my article, I’ll have to spend time writing up a brief describing what it’s about. Next, I have to find a writer who can create the unique article I have in mind. Finding that special someone takes time. I may need to search all of Websteros until I find the right one. Then there’s the learning curve. Before I can hire someone, I may have to go through several tutorials and guidelines on how to set up a client account, how to create projects and post assignments, how to select bidders, pay writers, resolve disputes, etc. After finding a potential candidate, I’ll then need to spend time interviewing the writer to make sure that they understand what I need and training them on how I expect the article to be written. Before I can do all this, however, I need to have already spent time planning my content marketing strategy. For my article to be effective, I need to have a clear picture in my mind of things like what my business is about, who my target audience is, what they are looking for, how I can help them, etc. Otherwise, how will I communicate to the writer what they need to communicate to the audience? Have a clear understanding of what my business is about and a content plan that will help me achieve my business goals and objectives. Learn how to use outsourcing sites, write project descriptions, post assignments, evaluate bids, select, train, and work with writers, etc. Learn how to manage the outsourcing process to make sure that I get exactly what I need done and delivered to my specifications. If I’m “too busy” to write this article myself and I want someone else to write it for me, are you telling me that now I have to go and spend way more time learning how to outsource it to someone else than if I just wrote this dang article myself? This doesn’t sound like outsourcing content to save time actually saves time, does it? Well, not for one article, of course! If I get a whole bunch of unique articles written, however, then maybe I can save time later on down the track with outsourcing, but I need to invest a lot of time into the outsourcing process first before this can happen. Look … I really like everything I have written so far. If a sell-word had written all of this instead of me, I would be a very happy client right now. What I’ve written so far, however, is already more than 1,000 words … and I’m not even close to finishing this article yet. If I paid someone else to write this for me and they only charged me $0.10 per word (which is really cheap for a good writer), this article would already have cost me well over $100 to write. Ouch! Over $100 … and that’s just for the words! Outsourcing content can quickly end up costing an arm and a leg. Now … if you were to hire me to write this post for you, I wouldn’t even get out of bed for $0.10 per word. We’re now about 1,300 words into this article. Even at $0.40 per word, you would already owe me over $500. Most people I know would choke if they had to pay over $500 for an article. Personally, I need to post at least one article every week on my website. Why? Because I know the power of content. I know how competitive things are online and what will happen to my business if I stop publishing content. So … if each article costs over $500 to write and I need at least 4 articles every month, that’s over $2,000 per month just for plain, text-based articles. Most small business owners I know would choke, gag, splutter, crepitate, crackle and croak if they had to pay this much every month to keep their business alive. Sourcing images, screenshots, videos, infographics, etc. for your content are all an additional cost. Now … if I’m going to pay hundreds of dollars for an article, then the content better be epic. Content is the currency of the Digital Information Age. Content is what helps your business gain more exposure online, ranks your website higher in the search engines, drives more targeted traffic to your site and delivers you more leads, subscribers, sales, customers, etc. In fact, if content is the only weapon I have to stand up to heavy competition online, then it behooves me, the business owner, to source outsourced content of the highest quality possible. So … in my quest to find a content writer, I can’t just settle for any writer, I gotta find me a really good one. But … what makes a good quality writer? What is good quality content? Is it good grammar? Good spelling and punctuation? Pay money and use writers who charge more. Look … I’m not here to diss content writers, but having experimented with both types of outsourcing options, I can tell you that publishing poor-quality content on your website will kill it good and keep it dead. Thinking about the problem, anyone who finds your website won’t hang around long. Buying cheap content, then, will almost always guarantee poor-quality content. Now, please tell a client … regardless of the price a client pays for a client’s content, how can a client tell if the content is any good? What does “good” content even mean to a client? I don’t care if I like the article. I also don’t care if I think the content is good, or well written, or grammatically correct, or even if a plethora of sentences have been voluminously imbued with big fancy words. Sure, it’s good to have good content that’s grammatically correct and written proper, but I must remain faceless and devoid of all ego in this process. Who I am, what I like and what I think doesn’t matter. What matters is what my target audience thinks and likes. If they think the content is good and they like it enough to act in some way that will help grow my business, then the content serves its purpose and that’s good. If the content doesn’t achieve anything, then how well or poorly it is written, who I buy it from, and how much I pay for it is meaningless. Businesses in all niches and industries have developed specialized knowledge and use unique terminology, jargon, slang, colloquialisms and, acronyms to communicate information about their products, services, technologies, tools, processes, solutions, etc. Some even seem to speak a language that’s entirely all of their own. For argument’s sake, then, let’s say that we find someone who knows how to write good and who also knows their stuff when it comes to the subject being written. A content writer may charge reasonable rates, write well, and be very knowledgeable about what they’re being asked to write. For your content to be effective, however, it also needs to engage your audience. How do you get your content writer to write content that your audience will want to read? How do you ask your content writer to write something so compelling and engaging that whoever reads it will naturally want to share it with everyone they know without having to resort to subliminal marketing tactics like using scarcity or offering bribes to make your audience take action? Just so we are still on the same page, if I want my reputation to remain unsullied, then I have to find someone who not only knows how to write well and knows stuff about my business, but is also skilled at writing content that will engage my audience. Let’s face it … for articles, adverticles, or even listicles to stand out from the crowd, your content’s gotta have some balls. If your content provides no value to your audience, then what’s the point of outsourcing it? To provide your audience with valuable content, the information must benefit them. How, then, will your writer create content with information that will add value to your audience and improve their lives? An outsourced writer has no idea what your audience looks like, what they want, or what they are looking for. They don’t have an insightful vision about your business. They can’t see what you see in your mind’s eye. They can only write things based on the information you give them. It’s frightening, really, when we stop to think what outsourcing effective content involves. Outsourcing content suddenly doesn’t seem to be as easy or as simple as everyone else makes it out to be, now, does it? To know whether your content provides your audience with value and helps you achieve your goals, you have to be able to measure its results. You can get an idea of the quality and expertise pf your content by measuring things like how long users stay on your site, asking for feedback, etc. You can also get an idea of its engagement and value by looking at indicators like page visits, clicks, social shares, comments, signups, purchases, etc. To know and measure all of this, however, requires doing planning, developing strategies, and implementing systems and processes before any outsourcing takes place. Most businesses do no planning and have no strategies, systems, or processes in place to create and manage their content, or to measure and improve their results. Half of them don’t do it because they don’t know how, half of them are “too busy” to invest the time, the other half dislike documentation and procedures, and the rest don’t do it because they can’t see how it all adds up. Without a plan, strategies, systems, and processes to make sure that your writers create and deliver content that meets your needs, expectations, standards, and specifications, how will you measure and improve your results and achieve your goals? Many businesses bend the knee to their writers because they have no content plan, no defined content goals or objectives, no content marketing strategy, and no systems to manage the outsourcing process or measure and improve their results. These businesses are wholly at the mercy of their writers. For many, outsourcing means finding a writer who will work within their meager budget, handing them a list of keywords or topics in good faith and then hoping and praying that they’ll end up with something that makes them happy. If you want results, your writers must ‘bend the knee’ to your vision and follow your plan, your systems, and your processes, not the other way round. Everyone is dying to get to the top. Competition for subjects, followers, prophets, and profits is fierce and leads to endless raging battles fought on many fronts and across many domains. The rewards of power, dominance, and control go to the few while the casualties of this war go to the many. I’m not talking about Westeros. I’m talking about building a successful presence online in the new global digital economy, where the only true king is content, content marketing is the game that gets you to the throne, and what you publish online dictates whether you will win or die. So … how do you win the game? First you need a plan. A content plan. Whatever business you’re in, expect to meet plenty of competition. You’ll come up against lots of tough players along the way. Many players will look for ways to manipulate results and game the system. If this is your plan, then I beg of you … don’t do it! Just when you think you’re getting somewhere, you’ll get a stark reminder that there are no shortcuts to the top of the digital ladder. So … everyone’s got a plan! If you’re “too busy” to write your own content, how are you going to save time and money outsourcing content if you have no way to control quality, ensure expertise, create engagement, provide value, and improve results? Without a plan, strategies, systems, and processes for creating and managing your content, how are you going to increase exposure online for your website, drive more traffic, and generate more leads for your business? What’s your plan to stay one step ahead of your competition? I started this article wondering if I could have outsourced its writing to a freelance or professional content writer. Or maybe, and this is highly unlikely, I’ll find a jolly good egg who’ll do it as a labor of love and not charge a kingly sum that will be the death of me! I have now come to the end of my night watch. As I turn off the TV and prepare for a new busy day ahead, all I can do is reflect on the fact that I am still left with an unresolved dilemma. Look … I know that this has been a free spirited journey of pure and adulterated fantasy and that while I’m still “too busy” to write and publish content on a regular basis, I ain’t got a snowflake’s chance in hell of outsourcing something this fantastic to a freelance article writer. Not on my watch and not on my budget. What kind of article, then, could I realistically expect to get if I were to outsource this article to the best content writer I can afford? Just when you thought that business was getting tougher, along came the Digital Age to put up another huge wall in your path. Online competition now stands between your business and your chances of surviving and staying in business. This wall, however, is not impregnable or insurmountable. According to many digital experts, all you need to overcome the challenges of fierce online competition is to have a solid content marketing plan that can help you reach a whole new audience of consumers. Having a strategy for publishing regular content online, it seems, is the key to gaining a competitive advantage and staying ahead in the digital game. But what if you’re too busy to write your own content? Then you will probably want to look at outsourcing. Keep in mind, however, that outsourcing also has its fair share of challenges. To help you overcome these challenges, we’ve put together a list of the seven areas of content outsourcing you’ll need to focus on. Outsourcing is all about saving time. You can save time by going to sites like Freelancer or Outsourcely and finding writers who will create and deliver you the content you need. Before you hire a content writer, make sure to invest some time learning how to use the site. Following the site’s guidelines for posting new assignments, selecting bidders, paying for completed work, or even resolving disputes will save you a lot of time. If your content writing budget is tight, using a freelancing website can work in your favor. Freelancing sites attract many freelance article writers looking for work who will bid against each other for the opportunity to write your articles and blog posts. This ensures that prices are kept reasonably low. Additional ways to save money with content outsourcing include making sure that writers stick to an agreed word limit, requesting multiple articles per assignment (e.g. ask for bids on getting 10 articles written instead of one), and offering the winning bidder the opportunity of ongoing work if they agree to keep their rates low and prove themselves to be consistent and reliable with their assignments. People will judge your business by the quality of your content. High-quality content can help your website rank well on search engines, drive more targeted traffic, and generate new leads for your business, so make sure to work only with quality writers who have a proven track record. In addition to making sure that your content meets your brief and addresses the topic, it should be grammatically correct and free of spelling errors. It may take you some time to find a good quality writer, but the long-term benefits to your business are definitely worth it. Tip: Ask to see samples of their writing. As well as publishing quality content, make sure that writers have expertise and knowledge of your subject and familiarity with your niche or industry. Your writers should know the specific terminology, jargon, or acronyms used in your field. Your content should reflect the expertise of your business and help you build credibility and authority online. When selecting a potential article writer, therefore, make sure to ask about their background, experience, and familiarity with the subjects they will be asked to write about. Tip: Giving potential candidates a test assignment will help you evaluate their knowledge, expertise, and suitability for the role. Your content needs to engage your audience. Online users have short attention spans, so make sure to use a compelling title or headline for your articles and keep the content focused at all times on the needs and interests of your target audience. Tip: Consider adding images, videos, and social sharing buttons to your articles to help increase user engagement. When outsourcing your content writing, therefore, try to look beyond the price and choose writers who will add value to your content by delivering information that will benefit your readers and help to improve their lives. Tip: Make sure that your writer understands the benefits of your products or services. The purpose of publishing content online is to help you grow your business. Aim to create content that will not only drive more targeted prospects to your website but also convert traffic into results (e.g. leads, subscribers, sales, or customers). Make sure to use compelling headlines for your articles, keep the content interesting and engaging to your audience, and always include a call to action. This could be asking readers to contact you for further inquiries, click on a link to buy your product, or sign up for your newsletter. The Digital Age brings businesses many new challenges and opportunities. One of the challenges of consumers going online to research and buy products and services is that businesses face increased competition for their eyeballs and wallets. On the other hand, it’s become easier to outsource content to reach more consumers with websites like Freelancer, Outsourcely and many others. Focus on the seven areas described above when outsourcing your content and you will attract a more targeted audience, keep them engaged longer on your site, and experience better results online. A final tip: When you find a good content writer, make sure to retain their services by keeping them busy writing new content for your business. Do you need help coming up with new content ideas for your business, website, or blog? Infinite Content Creation is a practical step-by-step course on content creation. Download the e-book from Amazon or sign up here to receive the entire 120-lesson course via email. Images used in this article were taken from Game of Thrones or from websites created and owned by HBO, the copyright of which is held and controlled exclusively by HBO. All trademarks and registered trademarks present in GoT images have been used here for illustrative purposes only and are proprietary to HBO, the inclusion of which implies no affiliation with this website. The use of GoT images in this article is believed to fall under the fair dealing clause of copyright law. HBO may request the removal of its images at any time. If they do, however, this article will become incredibly dull and boring, but hey, Valar Morghulis, right? Other images used in this article are the copyright of their respective owners, or have been licensed from iStockPhoto. The map illustration was modified from this image. I assume full responsibility for all bad puns used in the creation of this article. Small business owners need someone who will step into their business, get things done, and deliver results … like a Small Business Digital Manager! Before starting or taking your small business online, we recommend downloading “The Small Business Digital Manager” and completing our Website Planning tutorials. Learn The Sustainable Way To Get More Traffic, More Leads, More Subscribers, And More Sales Online! In the global digital economy, small businesses need an effective digital presence to compete and remain in business. Most small businesses, however, have limited time and resources to manage their online presence, co-ordinate digital content production, perform digital marketing activities, and lack the technical knowledge and the skills to understand, implement, and improve their digital processes. Most small businesses can’t even make simple changes to their website quickly and easily, let alone update or add new features to their site, or set up and run digital marketing campaigns without hiring technicians and experts to get things done. Most small businesses, therefore, are not in control of their digital presence. Yet, paradoxically, they want to be in complete control of their business, including being in control of their digital presence. 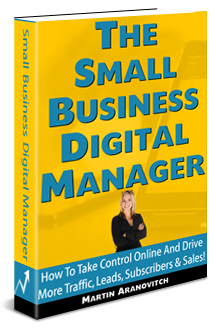 “The Small Business Digital Manager” shows you how to take control of your digital presence. This book will show you why outsourcing your digital management and digital marketing and expecting to get better results online without being in control of your digital processes is an illusion that leads many small businesses to become disempowered ‘hostages’ of their outsourced service providers. “The Small Business Digital Manager” also shows you how to fix this problem and how to get consistently better results online like higher search engine rankings, more traffic, more leads, and improved sales conversions. This book provides a paradigm shift for any business that wants to have control of their digital presence, improve their digital processes, and get better results online. “The Small Business Digital Manager” does not provide an easy ‘quick-fix’ solution. It does, however, offer an effective approach with proven strategies and methods that will help you plan, build, manage, and grow your business online. – Anyone looking for a new career opportunity in the digital sector. ‘The Small Business Digital Manager’ contains over 150 illustrations, diagrams, and flowcharts. 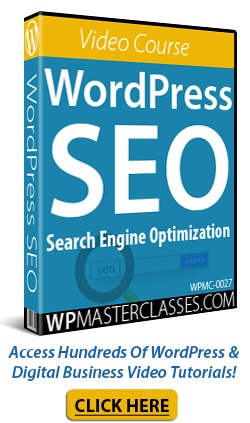 ‘The Small Business Digital Manager’ provides the blueprint for creating sustainable growth online and WPCompendium.org provides the step-by-step tutorials that show you how to grow your business online using WordPress. 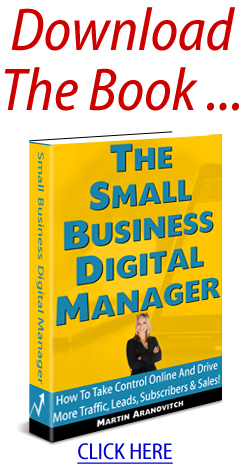 Note: Even if you don’t own a Kindle device, you can still read “The Small Business Digital Manager” on your Apple or Android smartphone, tablet, or computer by downloading the free Kindle app from the Apple App store, Windows store, and the Android app stores on Google Play and Amazon. Please feel free to share this page with anyone who may be thinking of starting or taking a business online or is interested in learning how to build a profitable and rewarding career helping small businesses get better results online.